Sitting along a two-mile stretch of coastline, Madeira Beach, Florida is the ideal family beach destination. 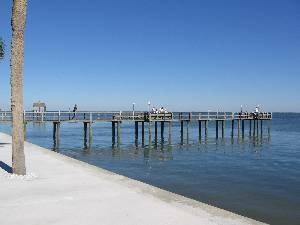 A small community, it is removed from the crowds of other populated areas in Pinellas County, and a stay at Madeira rentals means that you will be within walking distance from the beach if it is not right outside your door. The convenience of being close to the local attractions makes the beach rentals Madeira has to offer appealing to families looking for a relaxing and hassle-free vacation. There is an overwhelming array of activities in the Pinellas County area, but at Madeira Beach vacation rentals, the choice of public beaches for families is enough to appreciate the natural beauty that awaits here. Archibald Beach Park offers parking, restrooms, and showers, while Bicentennial Park near the causeway also has a convenient beach. The calm blue Gulf of Mexico and clean sand is there no matter which beach you choose from, and if you're lucky enough, you may find yourself stepping out the door of Madeira Beach condo rentals and onto the beach. Madeira rentals are so convenient because nowhere in town is far from the water. Make a sandwich in the kitchen and take it with you, or run back for a quick lunch before setting out to catch more rays. You'd never get that experience at a hotel or motel, but at Madeira Beach vacation rentals, the whole family is set free and everyone can just forget about the hectic city life just for a while. For some local fun, take the family out for miniature golf at Smuggler's Cove Adventure Golf, where you can take swings near rushing waters and caves in a tropical setting. Being situated near big resort areas makes getting to nearby attractions convenient. A short ride will get you to the Clearwater Marine Aquarium, the Gulf Beaches Historical Museum in St. Petersburg Beach, or the Tampa Bay Performing Arts Center. Should their ever be a need to leave this small coastal village, a family trek to the many shopping, entertainment, dining, and nightlife venues is just a short ride away. The savings of Madeira rentals on your budget opens the door for many possibilities, but everyone will be content with just staying local as the relaxation can be quite captivating. If coastal leisure and freedom from crowds are your thing, then Madeira Beach vacation rentals are the ideal choice for the whole family. Book with an owner today, as other vacationers will likely find this local paradise while looking for an alternative to the popular destinations in the nearby communities. The options are more affordable and convenient than hotels or motels that leave you straggling to finance your trip. It is not hard to find something that is satisfying to your peace-of-mind, budget, and any other vacation requirements at Madeira Beach condo rentals. Interested in More Madeira Beach, Florida? Check out nearby Clearwater , Indian Rocks Beach , Indian Shores , Redington Shores , St Pete Beach , St Petersburg , Treasure Island .